Fantasy author David Dalglish continues his series of the half-orc brothers, whose struggles will soon bathe the land of Dezrel in demon fire... Five hundred years ago, brother gods devastated their world with civil war. When they were imprisoned, their conflict ended without a victor. Centuries passed while their followers secretly continued the war, a war that will soon have an end. The gods have found their paragons. ------ Book Description: Their prophet dead and their home lost, the half-bloods Harruq and Qurrah Tun form a strained alliance with a band of mercenaries outside the city of Veldaren. As the brothers and their allies wage a private war against powerful thief guilds, forces greater than them all threaten to tear them apart and ruin any hope for a better life. Harruq must defend his family at all costs, for Qurrah's love of a girl with a shattered mind and the power of a goddess may doom them all. 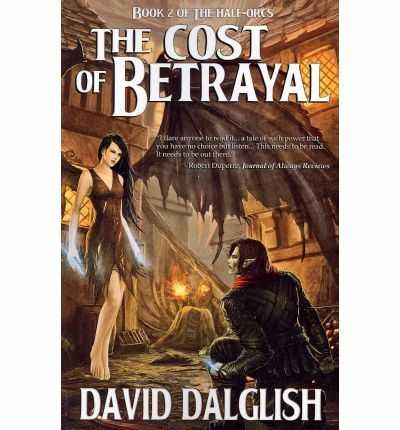 THE COST OF BETRAYAL by David Dalglish The death prophet returns, and the disloyal will suffer. ------ About the Author: David Dalglish currently lives in rural Missouri with his wife Samantha, daughter Morgan, and dog Asimov. He graduated from Missouri Southern State University in 2006 and currently devotes himself to perfecting his craft. He spends his free time playing racquetball and watching PBS with his daughter.